For many years, Al Hirshfield drew his celebrated caricatures for the Times. Alongside his signature for the Sunday edition (smaller individual drawings would often appear in the Friday edition beside what was then reckoned to be the most advantageously placed review of the week, reason being that men would take it home for the weekend and their wives would read it. I’m not making that up. That was the received wisdom of the day.) he would draw a number to indicate how many Ninas were hidden. The game was then to find them all, ‘Nina’ being the name of his daughter who did not appreciate this particular tribute from her doting dad. Now before all of this became one of the more irritating ways New Yorkers dreamed up to demonstrate their superiority to the rest of us, Al lived an adventurous and peripatetic life. At some point in the early 1930s he was manager of a hotel on an island some damn place in the Pacific: Bora Bora? Samoa? I don’t remember but that’s no surprise I don’t remember anything much except for how much I hate Mike Lee and all his works. As who among us doesn’t? Where was I? Right, for the sake of argument let’s say Samoa. One day a liner making a round-the-world voyage put in and guess who got off? That’s right, Al’s old friend Charlie Chaplin who was then at the zenith of his amazing career. Don’t ask me how Al knew him, this happened in the Past when presumably everyone knew everyone else. Here’s an important plot point so let’s all try to stay awake: there was no movie house on the island, not even a projector, so no one knew who Chaplin was. At first he pretended to be relieved but that soon turned to annoyance – that’s not me being snide, that’s what sets Stars apart from you and me. That and the money. So Al got all the hotel staff plus guests into the dining room, cleared a space, and let Charlie be Charlie. Needless to say, he charmed and amazed them all and was locally famous till the ship sailed taking him on to fresh conquests. In his later years Chaplin was largely forgotten apart from his notoriety. And the drive, ambition, and talent that propelled his earlier life became a torment. Which makes me think of Robin Williams. Though by no means forgotten his earlier colossal success was a thing of the past and I’m sure he found himself feeling worthless because he was no longer The Next Big Thing. No longer number one on everyone’s casting list. I do know depression only too well. Not personally, but I do live with it. I also know how people react when the one thing they feel they do well – though never well enough – is taken from them. If you haven’t ever seen it here’s that clip of Messrs. Williams and Crystal who arrive in the Friends coffee shop for no apparent reason and show everyone how it’s done. It’s heaven. Also, how many ninas do you see in the caricature? My boss in NYC was wealthy enough to have commissioned a Hirschfield of himself. It was a caricature of him hugging a pile of money at his desk. Didn’t they close that bagel shop on the upper west side? It was right around the corner from where I lived. @Tommmcatt Au Gros Sel: H&H. Yes, tragically. There’s still one somewhere in Midtown–maybe bloggie knows where. Do not speak ill of H&H Bagels again. We are still sitting shivah. @blogenfreude: Do we remember Goldberg’s pecan swirls? @Mistress Cynica: @Benedick: @blogenfreude: It broke my heart when I heard of it closing. They were perfect bagels. Perfect. @Tommmcatt Au Gros Sel: I feel that way about baps. @redmanlaw: Keep looking in that hat bit. Plenty of ninjas there. @redmanlaw: You never see them until it’s too late. @redmanlaw: This is why New Yorkers are so annoying. One of the reasons. One of the many reasons. They are perhaps the most annoying people you might ever meet. Unless you go to Hollywood. Anyhow, after a couple of tries you start to anticipate where Al hid them. That’s the best reproduction I could get because he licensed all his work to the Margo Feiden Gallery which is very strict about unofficial copies. But look to the right of his signature below the tip of the cane: there you’ll see the number 1. So one ‘nina’. Now look to Chaplin’s left sleeve as it concertinas above the hand thrust in his pocket. Turn it on its side and you’ll see ‘Nina’. Sleeves, drapes, trouser folds, the fronds of plants, were all favorite – and expected – hiding places to be gloated over while ingesting lox. Worldshaking. He was an immensely interesting man who kind of fell into his life and career. 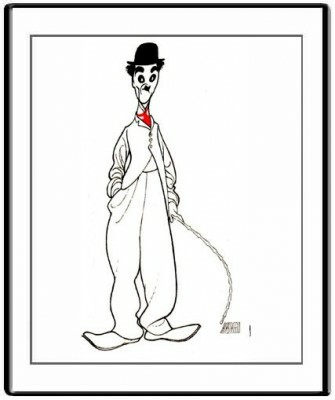 His caricatures were published till he was well into his 90s. Re clip, no YouTube here in China. Cat videos are anathema to social harmony. And I didn’t know about the Ninas.